Excavations in Tilaurkot during the period of 1967-1976, revealed that the earliest coins recorded in Nepal are ‘kushan’, ‘kaniksha’ and ‘havisha’ coins (1st century) and the ‘punch marked’ coins (6th and 5th century B.C.). Excavations in Tilaurkot during the period of 1967-1976, revealed that the earliest coins recorded in Nepal are ‘kushan’, ‘kaniksha’ and ‘havisha’ coins (1st century) and the ‘punch marked’ coins (6th and 5th century B.C.). King Mandeva’s rule in the 5th century gave birth to the Licchavi coins. It was during the Malla period that more systemization was brought in monetary terms. Coins were then issued in denominations of 2 mohur (equivalent to one rupee), 1 mohur (50 paisa), one and a half sukka (36 paisa), sukka (25 paisa), sukki, or ‘tinnani’, (12 paisa), anni (6 paisa), adhani (3 paisa), paisa (1 paisa), and dam (1/4 paisa). In 1545, Dolkha King Indrasinga Deva minted the first silver coins with the rupee coin weighing in at 11.6 gm (1 tola). During Mahendra Malla’s rule, the first silver coins were minted in the Valley with each 1 tola coin being called a Mahendra Malli. The ‘windblown type’ silver coin called ‘Fukadam’ (‘Chundam’ in Newari) was made during Jayaprakash Malla’s reign in Kantipur. Guinness Book of Records has reportedly listed it as the world’s smallest coin. During Prithivi Narayan’s reign, in 1754, the first Shah Dynasty coins were minted and the first silver ‘mohur’ coins were minted. During Mathasingh’s brief reign, (a Khasiya king of western Nepal who attacked the valley in 1328), while mostly noble and base metals like gold, silver, copper, nickel, brass and aluminum were used to make coins, coins made of clay were also issued. Such clay coins were given as tokens to laborers who having collected a certain number could then exchange them for real coins. At one point in the country’s history, leather coins, rumored to be made by ‘Sarki’ (a clan that traditionally worked in leather) kings, were also used. 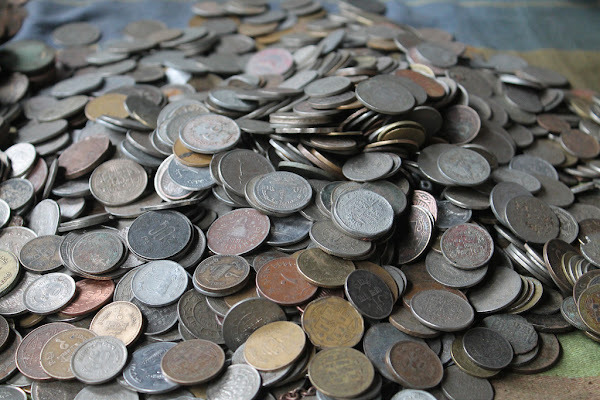 During the 1640s, Nepali coins were used freely in Tibet. One such coin was known as ’15 karma’. It could be fragmented to get smaller denominations called ‘chotangs’. The coins had a design of eight petals and so, fragmentation was based on the number of petals. For instance, 5 petals equaled 10 karma, 4 petals, 7 and a half karma and 3 petals, 5 karma. From the Licchavi period to until 1945, denominations and rates of coins were determined by weight of the metal used. It was in October, 1945, that paper money was first introduced here, when Rs.5, Rs.10 and Rs.100 bank notes were issued. Banknotes were known as ‘mohru’ until 1956.Starting with King Mahendra who succeeded to his father Tribhuvan in 1955, the banknotes were issued by Nepal Rastra Bank (Nepal National Bank) which was founded in April 1956. The signature of the governors of this institution is found on the banknotes which were issued after this date. Under King Mahendra the Nepalese Government became “His Majesty’s Government” (expressed by "shri 5 ko sarakar" which literally means “the government of the five times honoured”) and remained this way during the rule of Birendra and Gyanendra. Two series of banknotes were issued during the rule of king Mahendra: The first series shows the king in civilian clothes wearing the Nepalese “topi” while on the notes of the second series the king is shown in military uniform. The second series comprised for the first time notes of the high value of 500 and 1000 rupees.